This is an extremely attractive disc for the many adherents of lyric British choral music of the period from 1890 onwards. Most of these pieces were written between the 1890s and the 1920s. The honeyed glow of sound in On Craig Ddu attests immediately to the sensitive skills of the Carice Singers and the Naxos audio team. As a work and as a performance its combination of sated exhaustion and exaltation is striking. Quite a few of these Delius pieces of the 1880s I have not heard previously. It's good to make their acquaintance in such good company. A serene Ave Maria - not at all glutinous - is followed by a breezy good-hearted Durch den wald. The other skilled German settings are An den Sonnenschein, Sonnenscheinlied and Fruhlingsanbruch, the latter with some delightful echo effects redolent of Brahms' innocent folk-song settings. Naxos do not lay claim to these being first time recordings. He ute skal gildet stan has the ring of so many evocations of Scandinavian midsummer nights: tempered joy and again that glow. The two unaccompanied part-songs, To be sung of a summer night on the water, written during the Great War are likely to be familiar to Delians. They stand as a nicely calculated approximation of the short orchestral pieces for which Delius is famed. The somewhat up-tempo singing here looks forward to the dreamily ecstatic vocalises in Delius's Hassan music. Mr Parris and the engineering team produce a nice effect with solo voices standing out from the warm mêlée. The Splendour Falls on Castle Walls is a later piece and is nicely complex and romantically hazed. The Delius group ends in Midsummer Song with its nicely streaming wordless vocals and brisk sense of hiking in the sunlit high hills. As far as the Bax pieces are concerned this collection reminds me of a Hyperion LP never transferred to CD. There the singers were the BBC Northern Singers under Stephen Wilkinson. There have been a few other collections on CD since then including one from EMI where boys’ voices were part of the mix replacing the far better original choice of female singers. In the case of Naxos the Carice uses female singers to superior emotive effect. The Carice reading of This Worldes Joie has a very civilised and rounded tone. The swaying processional glow of medieval music speaking across the centuries is nicely put across. It could serve as a contrasting companion to the RVW Mass although the Vaughan Williams is more chaste than the Bax. This is Bax at approaching full maturity and his embrace with youth and grief for its passing is prefigured in the sung words, "For we shall die though we like ill"; in Bax's terms "For we shall age though we like ill."
The Five Greek Folksongs is a slightly unusual late work. It's up there with the Fauré Variations and Maytime in Sussex where high craft wins out over the sort of overwhelming emotional rasp of Bax's 1930s. These are skilled pleasant settings full of lively inspiration. The Carice bring life to these miniatures and make a good and prancing thing of the In far off Malta movement. Of a Rose I Sing a Song includes some beautiful instrumental effects. I have not heard the piece better done. I have a concern about the strangely-accented O sound in the word 'rose'. The male soloist is superbly balanced but that O needs to be more open-sounding. I Sing of a Maiden that is Makeless is like a sketch of an inspiration that ascends to fullest expression of religious and earthy ecstasy in Mater Ora Filium. In its own right this work and performance is nicely shaped and balanced. The Carice's trademark glow - "He came all so sweetly" is remarkable. 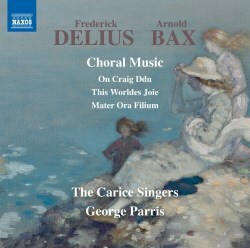 Mater Ora Filium the longest of Bax's unaccompanied choral pieces. It is a masterpiece in spirituality and of peace suffused beauty. It includes a complex and very testing weave of sound. Notable is the glassily exposed sound of the sopranos in the closing iterations of the words Mater ora filium. The words curvet and entwine amid pealing Alleluias. A very fine interpretation, enhanced to telling effect by the use of a large choir. It is a shame that the Carice did not include Bax's other short medievalist choral pieces: The boar's head and Now is the time of christemas. Very helpfully all the texts are given with a translation of the Latin words in Mater Ora Filium and of the Delius songs not in English. This disc stands as a companion to the Carice Singers' Naxos CDs of choral music of John Ireland and E J Moeran (8.573548) and Warlock (8.573227). I am pleased to see that this disc is produced by Jeremy Summerly of Oxford Camerata fame. He has already made a huge contribution to English choral music. All members of the Carice Singers are listed and the soloist voices drawn from the choir are also punctiliously identified by Naxos. I quibbled about Bax items not included. Before I let go of that tendency I should mention that the liner-note should have had "J B McEwen" not "J B McEwan" and "BBC Singers" not "BBC singers". Trivial stuff but perhaps for amendment at some point. This is a stunning disc in every aspect. It fits well into the Naxos catalogue and into an obvious gap in English music enthusiasts' collections.